The water collection area at the LORAN Station, South Caicos. Abandoned buildings at the LORAN Station, South Caicos. For a U.S. Coast Guard veteran’s personal account of life at the South Caicos LORAN station, see www.bliley.net. Found at Plandon Cay Cut on the northern point of South Caicos, the abandoned South Caicos U.S. Coast Guard LORAN Station is a very interesting site. Completed in 1959, this base was part of a global network of thousands of similar sites which allowed for global ship and aircraft navigation by triangulating low-frequency radio signals. LORAN stations operated as either masters or slaves, with the master sending out a signal which the slave stations responded to. Response timings between stations were accurately measured and vessels would listen in and make calculations to determine location. Although not entirely gone yet, LORAN in all its different variants has been almost completely replaced by satellite GPS systems. When operating, the site had an expansive concrete water collection hill, two large steel water storage tanks, an antenna tower, and barracks and operations buildings. 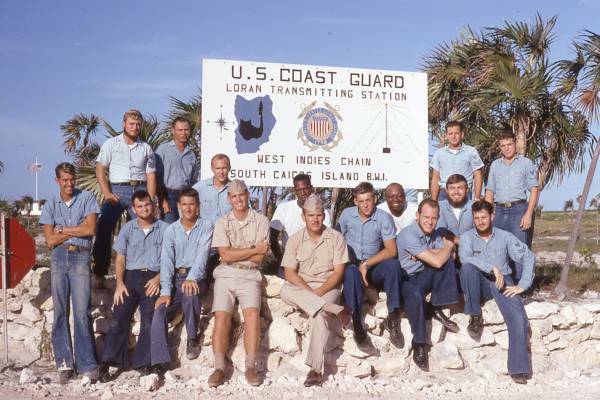 The crew of the South Caicos LORAN station in 1968. Photo courtesy of and copyright of U.S. Coast Guard veteran Charles A. Bliley (www.bliley.net). The South Caicos LORAN-A station ceased to operate at the end of 1980 when the many of the Atlantic and Caribbean stations was shut down by the U.S. Coast Guard when a change was made to the updated and longer range LORAN-C (which did not require as many ground stations). 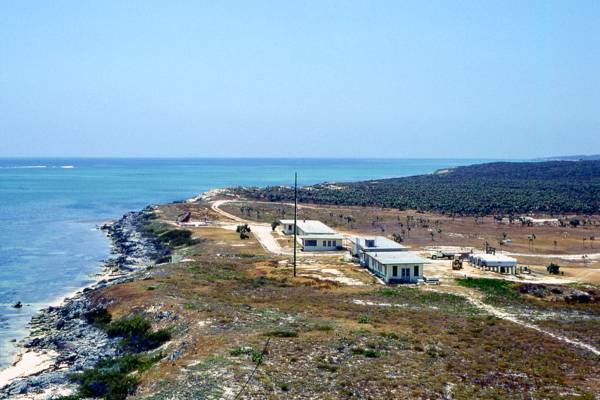 The South Caicos site was officially decommissioned in 1981. The LORAN station during its heyday. Photo courtesy of and copyright of U.S. Coast Guard veteran Charles A. Bliley (www.bliley.net). 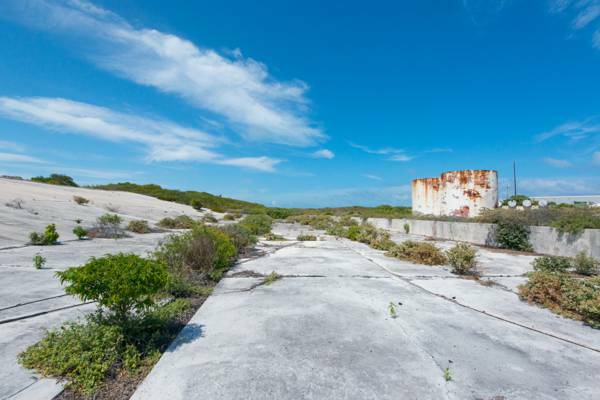 Today the site is largely overgrown by low scrubby vegetation, the barracks and living quarters are empty shells, the radio tower has collapsed, and the water storage tanks are decomposing with rust. Feral donkeys are the only regular visitors. South Caicos is a very scenic island with many beautiful landscapes, but the view to the west off the high ground near the LORAN station is probably the most impressive on the island. On a sunny day, a tremendous range of blues, turquoises and greens can be seen in the water here at Plandon Cay Cut, Bell Sound, and around the small islands between South Caicos and East Caicos. This is not an official tourist attraction. There are dangers present, such as sharp rusted metal and the risk of the collapse of concrete and metal structual elements. This article is provided for general educational purposes only. 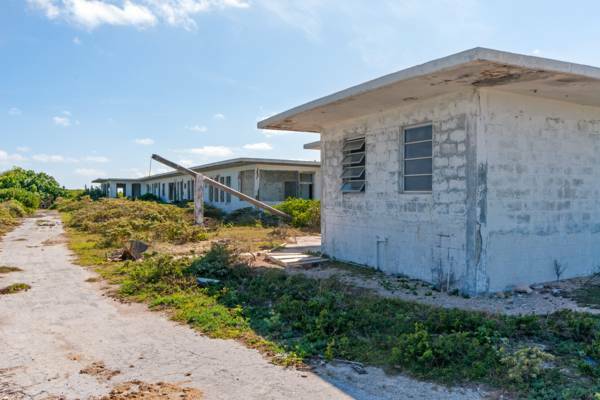 The abandoned United States Coastguard LORAN station, South Caicos.